Hemi-Sync is actually a brand name for a programme which utilises binaural beats. 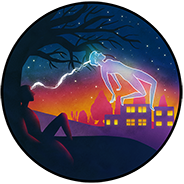 The process was designed by well known astral projection researcher Robert Monroe. The phrase ‘Hemi-sync’ has become synonymous with binaural beats to a degree. Hemi-sync is short ‘Hemispheric Synchronisation’. By using binaural beats, the programme allows the user to change their brainwave pattern to enter a desired state. See ‘brainwaves‘ for more on different brain states.